Real Madrid met their match tonight at the Santiago Bernabéu, as an upstart Villarreal side pushed the Merengues to the brink in an enthralling game that would finish 1-1. Both teams came into the match missing several players, but the ones on the pitch put on a show for the ages, in what was frankly one of the most exciting games in La Liga thus far this season. With the result, Real Madrid dropped two important points and are now sitting only two points ahead of Barcelona, who won yesterday 3-1. From the first minute it was clear that Marcelino Garcia Toral's Villarreal squad was more than up to the challenge. On the 12th minute, Real Madrid found themselves scrambling. A deflected shot fell to the feet of a barely-onside Gerard Moreno, but he was met by a sprawling Iker Casillas who made a point blank save. The follow up would fall to Moi Gomez and his well-placed shot would beat Casillas but not Dani Carvajal, who defended the goal with a diving header off the line. In the 31st minute, it would be yet another header spreading the panic in one of the boxes. This time it happened on Real Madrid's last third of the pitch, where Gareth Bale rose above everyone to meet Marcelo's fantastic cross, but angling it too much and sending the ball was just a bit off target. Bale again would pose a threat in the 42nd minute, after an errant cross from his weaker foot bamboozled everyone including Villarreal keeper Sergio Asenjo, who had a fantastic game for the Yellow Submarine. Real Madrid would come out in the second half looking for blood. Ronaldo's step-overs preceded a low and hard shot in the 48th minute, but Asenjo, as he was for the majority of the night, was again there with the save. But Cristiano Ronaldo would get his revenge three minutes later from the penalty spot. The Portuguese star won the penalty himself, after he was wrestled to the ground by an impressive youngster Eric Bailly inside the box. 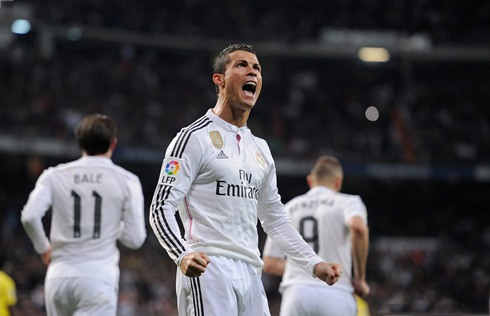 Ronaldo stepped up and as usual, he converted the spot kick before running off into his patented celebration. Villarreal however, would fight back and they were rewarded on the 64th minute after Moreno, who had already missed a good chance earlier on the night, made amends from the edge of the box with a sweetly struck left footed shot into the corner of the net. There was some lax defending from Real Madrid on the play, as they were unable to clear the ball and saw it ricocheting around the perimeter of the area. Ancelotti's men would find themselves in real danger of going behind around the 77th minute of the game, when substitute Luciano Vietto found himself in the clear heading towards goal. But with Pepe pressuring, the young Argentine lost his balance at the most crucial moment and a thankful Casillas picked up the ball. A final clear cut chance would fall to Jese in the 85th minute, after Asenjo mishandled the ball, but with an open goal in front of him, the youngster rushed a tame effort past the post. 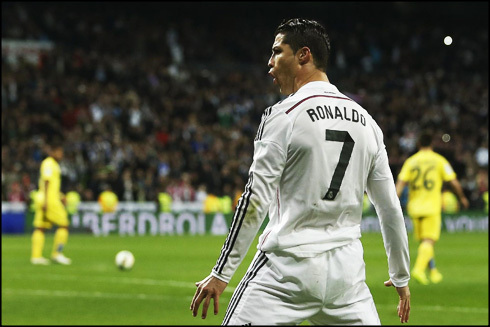 Cristiano Ronaldo next game will be in La Liga against Athletic Bilbao, on the 7th of March of 2015. You can watch Juventus live stream, Athletic Bilbao vs Real Madrid, Villarreal vs Barcelona, Manchester United vs Newcastle, QPR vs Arsenal, and Dynamo Dresden vs Borussia Dortmund, all matches provided from our soccer live stream section.